We are very proud to be featured on the cover of this month’s latest issue Sign Media Canada Magazine! 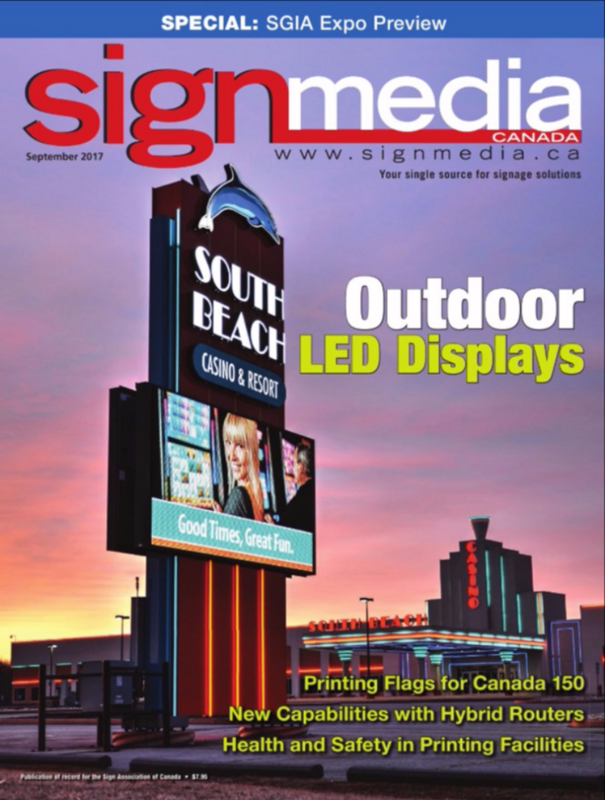 Via Sign Media Magazine... Winnipeg based Electra Sign is the only Canadian winner in Watchfire Signs’ 2017 LED Sign Awards program, honored for the pylon sign it built for South Beach Casino & Resort on the Brokenhead Ojibway Nation Reserve. Designed with an art deco theme and installed in 2016, the pylon sign features a high-definition (HD) light-emitting diode (LED) electronic message centre (EMC) from Watchfire beneath the facility’s name and blue dolphin logo. The Casino is located 30-minute drive north from Winnipeg on High 59 and features the art deco theme throughout.